Former president Nelson Mandela among guests at the event. JOHANNESBURG, South Africa (CNN) -- Jacob Zuma was inaugurated as president of South Africa in an exuberant ceremony Saturday filled with heads of state and former presidents. 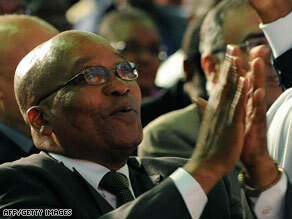 Jacob Zuma has been sworn in as South Africa's president after the ANC won a landslide victory. The large crowd at Union Buildings -- the president's residence -- in Pretoria broke out into song many times before and during the ceremony. Zuma was elected president Wednesday by the parliament after his party won a landslide victory in nationwide parliamentary elections last month. Zuma's African National Congress party won about 66 percent of the vote in the elections. Zuma is an ethnic Zulu whose flamboyant style sits in contrast to more staid predecessors Nelson Mandela and Thabo Mbeki. Mandela was one of the guests at the event. The ANC has been dogged by allegations of corruption and has been accused of failing to deliver services to the poor. The country's prosecuting authority dropped fraud and corruption charges against Zuma two weeks before the elections, citing alleged political interference in the case. A self-described "farm boy" known to don traditional garb -- including leopard skins and a spear -- at ceremonial events, Zuma, 67, would put a different face on the party than Mandela, the attorney imprisoned under segregationist apartheid rule, and the Western-educated Mbeki.